Categories: 4-20 mA, Digital, Output, Type Of Transmitter, Transmitters, Input, RTD, Thermocouples, Isolation, Unisolated, Measuring Channels, 1 Measuring channel, Design, Head Mounted. 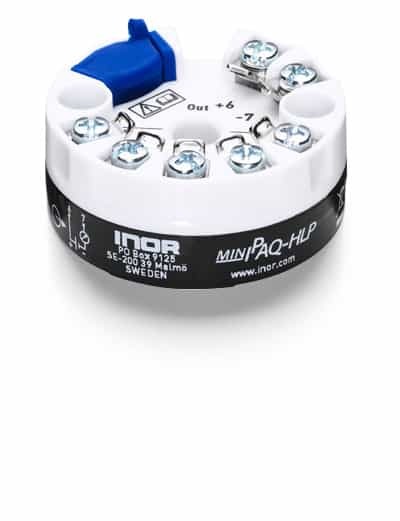 MINIPAQ-HLP is a basic, programmable non-isolated, easy-to-use 2-wire transmitter. The Low Profile housing has a hight of only 18.5 mm / 0.72 inch. Configuration is made in seconds with the user friendly Windows software, MINIPAQ Soft. No external power supply required for configuration. The transmitter is programmable for RTD’s in 3- and 4-wire connection according to different standards as well as for 11 T/C types.